On December 24, Palestinians, many of them dressed as Santa Claus, staged a rally in the city of Bethlehem in the West Bank protesting against to the US recognition of Jerusalem as Israel’s true capital. Israeli forces used tear gas and stun grenades against the protesters near an Israeli military tower in Bethlehem. This rea is widely known as the traditional birthplace of Jesus Christ. In the interest of peace, Safdar Khwaja from CAIR reminds us that Muslims revere Jesus highly, and believe in the divine origin of the holy books of all three Abrahamic religions. She reminds us of the need to work together, for there is much to be done in our broken world. At the end of the article, If Americans Knew offers you some photos of Christmastime in Bethlehem, where there is genuine interfaith peace. The Christmas season brings lights, cheer and charity across America and prayerful celebration of the Christian savior’s birth in churches across the world. Greeting cards proclaim “Joy to the World,” though people might wonder just how to spread joy. Christian Americans also might wonder how non-Christians perceive the festive Christmas season — particularly Muslims, given all the controversy about them that’s been stirred up in recent election cycles. This significant Hadith is neither unique nor an isolated forecast in Islam. As the youngest of the three major Abrahamic faiths, Islam recognizes all of the revelations and commandments of a singular God (Eloh in Hebrew, Alah in Aramaic, Ilah in Arabic, Allah as “the-God” in Arabic), as a continuum of God’s messages. The Scrolls (Abraham, pbuh), Torah (Moses, pbuh), Psalms (David, pbuh), Gospels (Jesus, pbuh), and Quran (Muhammad, pbuh), are all recognized as of divine origin and included in the faith of Islam. Followers of these divine revelations are recognized as “People of the Book,” with marriages allowed among them, which has led “mixed” families over the centuries to develop close relationships. Jesus is mentioned 25 times in the Quran in many contexts, including as a messenger of God, as the Messiah, as the “word” and “sign” of God, as endowed with healing miracles, as ascending into heaven, as promising to return. The Quran mentions the virgin birth of Jesus many times. He is the only prophet who is mentioned along with his mother. The Quran’s chapter 19 is dedicated to Mary (Maryam), who holds a singularly exalted place in Islam, being the only woman named in the Quran. She is referred to 70 times in multiple chapters, and she explicitly is identified as the greatest of all women. To Muslims in America, celebration of the life of Jesus and acts of charity during the Christmas season are very similar to their own traditions. The two major Muslim celebrations, or Eids, feature charity, prayers and festivities. They occur following the month of fasting (Ramadan) and at the commemoration of Abraham’s (pbuh) commitment to personal sacrifice. Celebrations such as Christmas and Eid are meant to renew the foundations of our beliefs. Humanity has massive challenges to overcome; disease, poverty, hunger, ignorance, war, the list goes on. These challenges require a new paradigm of collaboration among people of all faiths, or no faith, from the local to the global level. Interfaith dialogue is growing here in Pittsburgh, but participation remains sparse. In our “home of the brave,” we need more brave souls who are willing to listen to the narratives of people who are very different from themselves. May our leaders be brave. May they employ their energies and talents toward bringing us together rather than driving us apart. May they help us solve the intractable problems we face by harnessing our common values and humanity. May this spirit of cooperation bring us joy. Safdar Khwaja is president of the Pittsburgh chapter of the Council on American Islamic Relations, the largest Muslim civil rights and advocacy organization in the United States. Santa is an equal-opportunity acceptor of donations. Catholic clergymen outside the Church of the Nativity in Bethlehem. Is Patagonia to Become the New ‘Promised Land’? Bible scholars have pointed out that the Gospels of Matthew and Luke appear to have been written with two different audiences in mind. The Gospel of Matthew seems to have been directed at a Jewish audience, while the Gospel of Luke would appear to have been written with a primarily Gentile audience in mind. It is almost as if the Jews have gone from being divinely blessed in the early part of the gospel…to divinely cursed in the gospel’s closing chapters. The reason I make mention of the birth story from Matthew is not solely because we’re in the Christmas season, but for a couple of other reasons as well. One has to do with a commentary published recently by a rabbi by the name of Brant Rosen; the other in regard to some interesting information presented recently by Thierry Meyssan of Voltairenet.org. Let’s take Rosen’s commentary first. Perhaps Rosen isn’t the only Jew worried about a cataclysmic disaster at this point–and this brings me to Meyssen’s article. Meyssen comments that it is “impossible for the moment to determine if Israel is engaged in a programme for the exploitation of Antarctica, or if it is building a rear base in case of defeat in Palestine.” Of course if nuclear war breaks out between the US and Russia, Patagonia and Tierra del Fuego would probably be among the less severely impacted parts of the planet–so that might be a factor in the thinking as well. I don’t know. Jewish success in the world is completely contingent upon the failure of other peoples. Jews experience good fortune only when gentiles experience catastrophe…The difference between Jews and gentiles is not historical or cultural, but rather genetic and unalterable. But the fact is that numerous other rabbis, despite this ‘venerable’ spiritual tradition, hold views similar to Grama’s. Whether theirs is a theological ideology or a political ideology, it is an ideology nonetheless that has brought “catastrophe” upon Syrians for the past seven years–and upon Palestinians for the past seventy years. It may at some point bring catastrophe upon others as well, including Americans. Given the unemployment rate and the totally unprecedented degree of wealth disparity we’re seeing, some might say it already has. If Jews who subscribe to Talmudic precepts should continue in their endeavors at foisting these catastrophes, the result is going to be a “cataclysmic disaster” upon Jews themselves–if that is the point Rosen is trying to make, then I agree with him and I think his prediction is correct. What I would say to Jews in general is that moving to Patagonia is not going to save you. Unless you change your ways, you’re going to be hated and resented there just as you are presently hated and resented in Palestine, and just as you have been hated and resented most everywhere else you have settled and lived for the past two millennia, going all the way back to the riots of Alexandria in 38 A.D.–or even earlier. The only way to break this cycle is by learning to act with kindness, to treat others with love and compassion–which of course were the precise teachings of your messiah–that is to say your true messiah–Jesus. Doing this would not only save you, it potentially would save humanity as a whole, for the entire planet is teetering on the edge of the abyss right now. January 7 is celebrated as Christmas day by millions of Orthodox Christians around the world. A midnight liturgy is scheduled for tonight at Moscow’s Cathedral of Christ the Savior. You can watch the service here. Merry Christmas to all! Filed under: Christians, Christmas, Jesus, Orthodox, Russia | Tagged: Christmas, Richard Edmondson |	Comments Off on Merry Christmas Russia! Speaking on Tuesday of this week, CIA Director John Brennan accused Russia of waging a “scorched earth policy” in Syria. I think clearly we can see evidence of this in the above video. All kidding aside, Christian charity seems very much alive in Aleppo, and Russian soldiers apparently are quite in the Christmas spirit (The Russian Orthodox celebration of Christmas takes place this Saturday, January 7). The children in the video reportedly are saying “Thanks Russia” in both Arabic and Russian. The video below is a tad bit older, having been uploaded back in September of 2016, though a similar spirit of giving is very much on display. “What the Russians have done in Syria in terms of some of the scorched earth policies that they have pursued that have led to devastation and thousands upon thousands of innocent deaths–that’s not something that the United States would ever do in any of these military conflicts,” the CIA director said in an interview with PBS. We see what he’s done in places like Crimea and Ukraine and in Syria. He tends to flex muscles, not just on himself, but also in terms of Russia’s military capabilities. He plays by his own rules in terms of what it is that he does in some of these theaters of conflict. Playing by our “own rules” is of course something that the US and its “special” friend Israel both excel at, but I don’t suppose we’ll hear Brennan admit to that anytime soon. 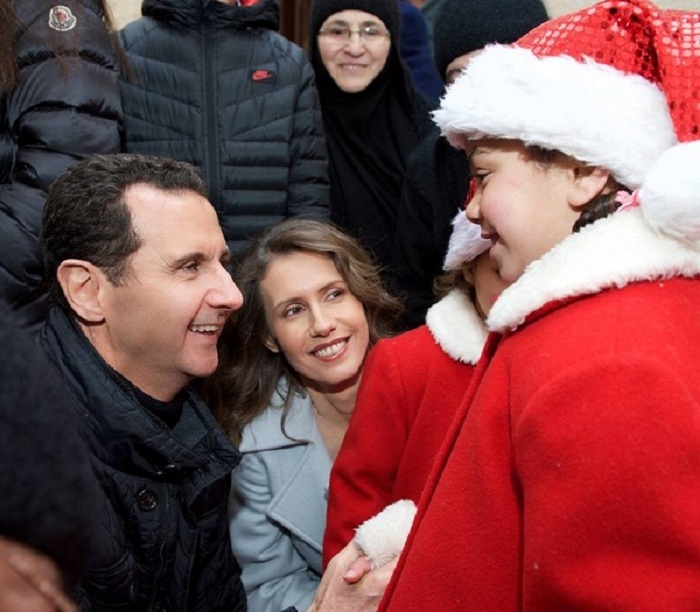 In any event, it’s good to see the children of Syria experiencing the joys of Christmas despite the scorched earth policies directed against them–not by Russia, of course, but by terrorists backed by the West and its allies. 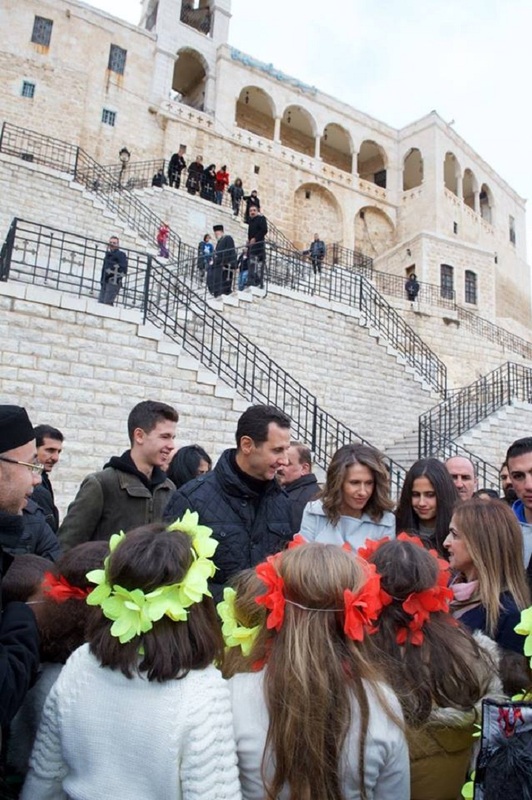 President Bashar al-Assad and the Syrian First Family joined the sons and daughters of the martyrs for Christmas celebration in Saidnaya Convent. 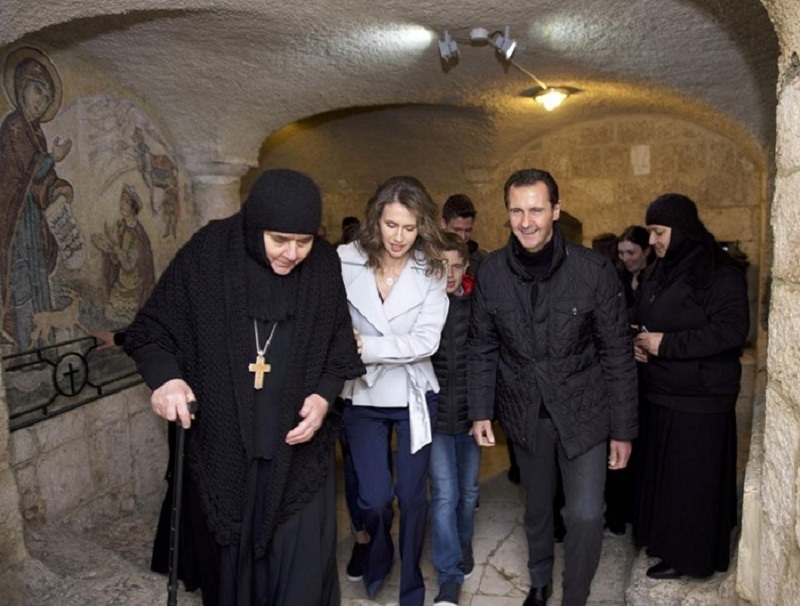 Christmas services held in churches across Syria.